Your WordPress security is only as good as your WordPress password security. If you have a simple password, you have a simple site to hack. 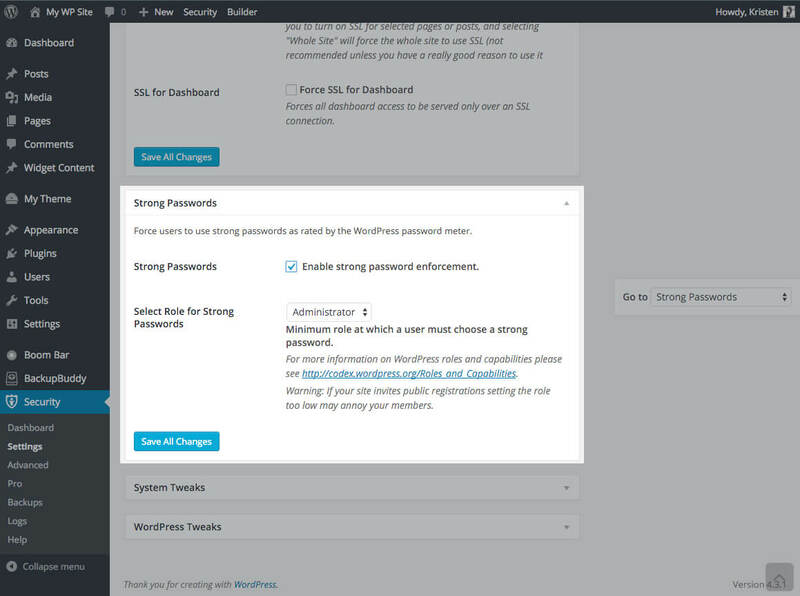 The iThemes Security plugin allows you to enforce strong WordPress passwords for all the users on your site. From the WordPress dashboard, expand the iThemes Security menu. From the drop-down menu, click Strong Passwords. From this section, check the Enable strong password enforcement. Click the Save All Changes button. After enabling strong password enforcement from the iThemes Security dashboard, visit any user profile page. In the Account Management section, you can generate a strong password with just one click. With iThemes Security Pro plugin, you can enable WordPress password expiration. We recommend changing passwords every 120 days, or 4 months, and with this setting, you can force users to change their passwords after a certain number of days. From your iThemes Security Pro Dashboard, visit the Pro tab. Once you’ve enabled password expiration, can select the minimum role for password expiration. You can also choose to force a periodic password change and even set the maximum password age (the number of days a password can be in use before requiring a new one). See the 30+ ways iThemes Security protects your WP sites. Pro users can take advantage of features like ticketed support, Malware Scanning and WordPress Password Expiration.